Naming boats has a rich tradition going back many hundreds of years and covering everything from the largest commercial tankers and war ships to dinghies. The reasons for naming boats vary, whether to honor a hero, a monarch, a loved one, a city, or simply to show a sense of humor. The naming of a boat often includes a special ceremony, sometimes accompanied by a launching or simply a christening. But whatever the occasion, whatever the size of the craft involved, the naming of a craft signifies the unique relationship we have with boats. People don’t stencil names on the back of their cars or on the door of their homes. Famous boat through history will always be remembered by their names, whether it is the Nina, Pinta, Santa Maria, Mayflower, Queen Mary or Titanic. But naming personal boats takes on a personal touch. 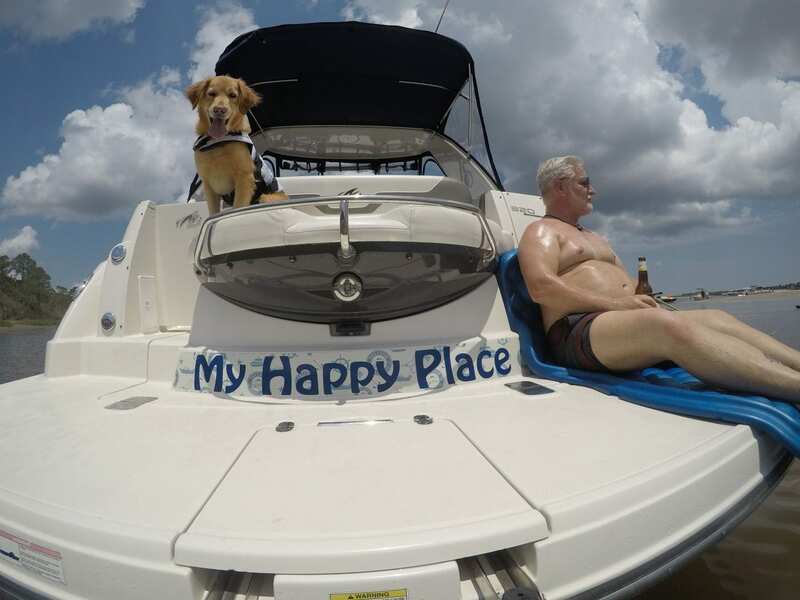 One of by favorite boats is named after Buddy Boy, a beloved one-eyed Golden Retriever who died a little over a year ago. My personal boats are named The Boatanista (for obvious reasons) and My Happy Place. I enjoy seeing the creativity people use in naming their boats. Some of my favorites include: She Got the House, A Little Nauti, Fish & Chicks, Ship Happens, A Better Wetter, Seas the Day, Fear Knot, Buoys of Summer, Wake and Bake, Aquaholic, Liquid Asset.